WANT = What the hero desires and believes will make them happy. WANT is the motivation behind the hero’s GOAL. FLAW (personal characteristic) + LIE (personal belief) = What prevents the hero from achieving their GOAL. NEED = What will actually make the hero happy. The NEED overcomes the hero’s FLAW and counters the LIE they’ve believed up until the Climax of the story. Recognizing this need is what prompts the hero to change; acting on this need is what allows the hero to triumph in the end (which may or may not involve achieving the original GOAL). Note: The above applies to stories with a positive character arc rather than a negative character arc. Also, an arc period. Some people don’t think having the hero change is a necessary part of a story. I do simply because I prefer stories where the hero changes and am disappointed with stories where the hero doesn’t change. But I recognize that this is my opinion and not the law. Notice the use of the word “personal” in the definitions above. Most students of writing craft learn that the hero’s NEED is something deeply personal that affects the hero. Truby calls this a “psychological need.” However, he also identifies another type of need: moral. “In average stories, the hero only has a psychological need [that] involves overcoming a serious flaw which is hurting nobody but the hero. In better stories, the hero has a moral need in addition to the psychological need… [which is] hurting others.” — John Truby, The Anatomy of Story, pg 41. So, if there are two types of NEED, there are two types of character FLAWS: psychological and moral. Sometimes a psychological flaw (such as alcoholism) has an obvious moral flaw (hurting the ones you love) attached to it, but not always. Take a psychological flaw like low self-esteem. How does that flaw hurt others? It’s easy to brainstorm ways, but up until now, this is not something I’d ever made a point of doing. And I realize this was a missed opportunity to: 1) add more poignant conflict to the protagonist’s relationships; 2) create deeper stakes; and, most importantly, 3) perfectly intertwine Character Arc and Theme. In my post The Controlling Idea – Not Your English Teacher’s Theme, I talk about how a story’s Theme always revolves around a human value, and when we test values we are debating morals. But before coming across this concept of a hero’s “moral need” I had developed Character Arc and Theme separately. I knew each was affected by the other, but my process was more like putting two things side-by-side and trying to make them complement each other. Now I approach Character Arc and Theme as puzzle pieces that fit together and develop them in tandem. This was such a lightbulb moment for me, and made my WIP’s character revelation scene finally click into place. I’ve been playing with the character arc for months. It’s always been connected to the theme, and there was a moral flaw in there somewhere too, but before I clearly identified the moral need, I hadn’t been able to really focus my heroine’s character change into something powerful. Now I think I have. In conclusion, the tiniest writing tips can be just what you need for a story breakthrough. PS – Are you wondering why Dustin Hoffman from the movie Tootsie is in the title card? Well, because his character is a perfect example of psychological and moral need working together, as John Truby discusses in THE ANATOMY OF STORY. Camp NaNo & My Escape From The Outlining Outhouse! That is definitely true. But unless the character lives all alone, their flaws will affect others; the trick is to figure out how the MC’s flaw affects others. And that’s the moral need. Thanks so much for posting this. I’ve been in the same place of finding very little in writing instruction that I didn’t already know, but this is helpful. Just when you think, “Oh darn, do I really want to read another post about something I already know–there it is something new and HELPFUL. Thanks again. Yep, right there with you! Glad I was able to share something new and helpful. Thanks for the comment, Faith! I hadn’t considered this much before, or maybe I didn’t realize what the best stories were doing with their characters’ needs. 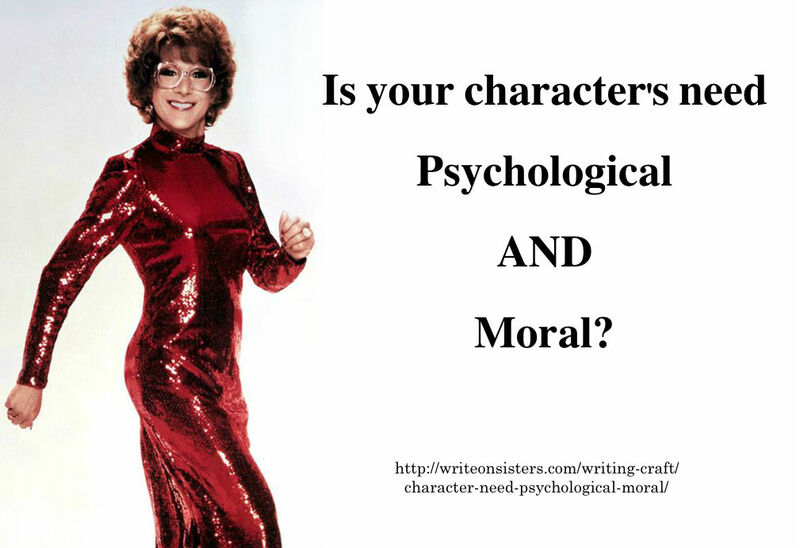 The psychological need affects the protagonist, while the moral need affects those around the protagonist. When both are present in a story, it can add so much more depth. Thank you for sharing this, Heather! I am going to comb through my favorite stories now and see what moral needs they used. It’s very interesting and something I want to use in all of my writing! Thanks for bringing this book to our attention and pointing out the dimension of character development that’s possible to achieve by being aware of want and need. You’re welcome! Hope everyone finds the book as useful as I do! I hate playing the English major card, but your wonderful post touched on a pet peeve: saying/spelling “compliment” when “complement” is the intended thought. Now I’m ready to read it again and absorb your insightful observations! I thought it was great! Your ideas are what good writers are looking for. Thanks for sharing! Haha! ? The English major card. It’s like an ace. It’s difficult not to use it if you have it. Well, I had never realised it consciously, but I think my project already have these two elements. And I think they are actually the more intersting part of my MC’s arc becuase the psychological need and the moral need pull him in two different direction, though they all comes from deep inside his personality. So happy to hear that! Thanks for the comment, Sarah.